(Tweezer) Tweezer is great for ingrown hair, extremely short hair or any missed spots after shaving or waxing. It's carbon steel material is comfortable to hold. It's unique slanted tip gives a better control of the tweezer. (Double Side Eyebrow Pencil) Unlike regular eyebrow pencil that requires sharpening, our pencil only needs a gentle twist for pencil tip to come out . The brow pencil has a unique slanted tip that glides on your brow so easily . Together with brow pencil brush on the other side, that smoothly brush out the colors on your brows, to create that perfect natural eyebrows. It's dark brown color and it's waterproof, so feel at ease during rain, swim or sweat. 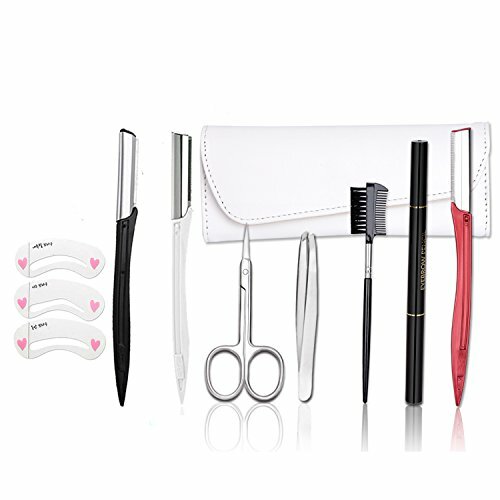 (Stencil Eyebrow Shaping Templates) contains three different shaped templates for beginners to choose from. Gives yourself the perfect eyebrow shapes with the help of those templates. There is a perfect sized box for easy storage in your purse.